What’s good to eat Thanksgiving week is favorite no-cook food, and lite faves. I’m getting fresh home style cottage cheese from the supermercado, maybe mix with shredded carrots, capers, scallions and maybe not. I also scored a deal on mangoes and papaya chunks. My favorite peanut butter for grownups sandwich, the Tineka, my candidate for one of the best sammies of all time, from Cafe Lula in Chicago. It is electrifying with chili paste, sweet soy sauce, cukes, red onion and sprouts. Roast pork shall be eaten hot, cold, shredded, stirfried or nuked until it’s gone. I am lucky to love fruit and eat a bunch of it, clementines and honey crisp apples now. Hummus for healthy lunches. I think maybe after the turkey Ima go to Costco, get a crate of mangoes and make mangoneada popsicles. The supermercado has the sekrit ingredient, chamoy sauce. There are dozens of blogs on bento box lunches for kids which a.) are terrifying in their samurai tiger momness and b.) lack sandwiches and c.) are therefore inherently boring. Terrifying and boring is not my bag. It’s pretty much the definition of hell and in-laws, as far as I can make out. I once had a discussion over at LiveJournal on the very best sandwiches of all time. 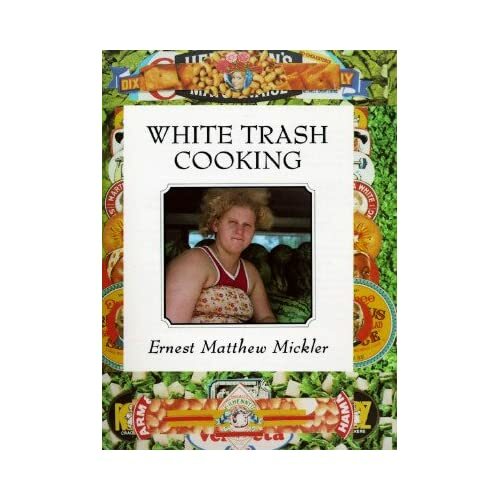 The very best were concocted by a Sinophile from New Orleans, who added mint or coriander to every sandwich as a matter of principle — learned, I think I recall, from her shrimp-fishing Vietnamese neighbors on the bayou. 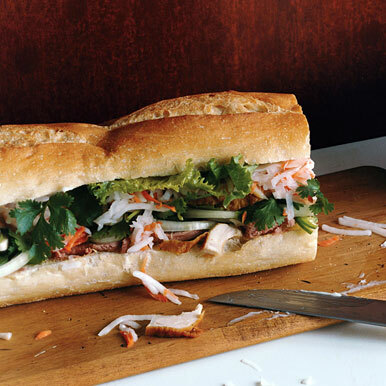 You know that banh mi sandwiches, with French bread, Vietnamese pickled vegetables and grilled meat or pate, the aforementioned mint or coriander, are the best sandwiches in the universe. Shred daikon and carrot in a food processor fitted with medium shredding disk. Stir together vinegar, sugar, and 1/2 teaspoon salt and toss with shredded vegetables. Let slaw stand, stirring occasionally, 15 minutes. Meanwhile, heat baguette on rack in oven until crusty, about 5 minutes. Cut off and discard round ends, then split baguette. Mix together oil, fish sauce, and soy sauce and brush on cut sides of bread. Spread liverwurst on bottom layer of bread and top with chiles, onion, and cilantro. Drain slaw in a colander. Arrange chicken, slaw, and lettuce on cilantro. Spread top layer of bread with mayonnaise and cut sandwich crosswise into fourths. Aside from the incredibly delicious daikon/carrot slaw, and the combination of liverwurst and chicken the very idea of which makes me swoon, I think the take-away genius technique of this recipe is the spreading of the bread with the oil/fish sauce/soy sauce mixture. That could make any sandwich worth eating, even a scaled-back, budget, skinny, or semi-vegetarian banh mi consisting just of slaw, coriander, and fish sauce. Mmmmm. I do believe the flavoring on the spread, and the care with which the spread is taken to the very edge of the bread, and beyond, is the secret of a good sandwich. Just as anchovy butter is the real secret of every tea sandwich you have ever eaten, whether you know it or not, and whether or not you like anchovy, another just-let-me-die-now sekrit spread is miso mayonnaise. Oh god. Mrs. Grieder of the famous Gay Head luncheonette in Martha’s Vineyard wouldn’t let anybody else make her lobster rolls, according to Louise Tate King. The secret was — aside from buckets of hour-old lobster — carefully spreading the hot dog roll to its edge with butter, and grilling it very slowly. Add lots of finely minced celery, and a touch of grated onion if you’re feeling less Puritan, mayo, and the lobster. Almost as delicious are my two candidates for Healthy Lunch Meat, one from the late Griffin Market, at 28th and P in Georgetown, and one I ganked from the over-explanatory food-trendy menu at Cafe Lula in Chicago. 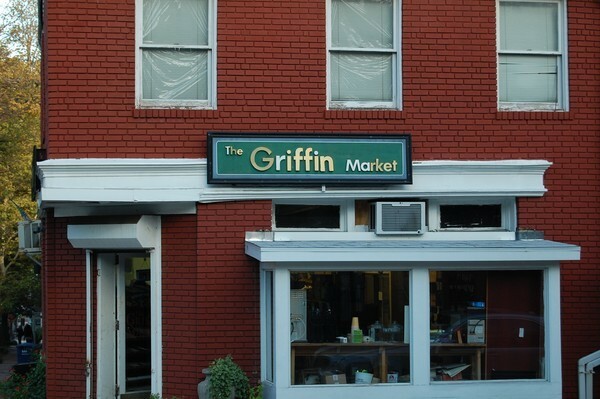 The late, great Griffin Market in D. C.. The Griffin Market one isn’t particularly calorie- or budget-conscious, so I save it for very special occasions. The Cafe Lula one I save to eat until there are real tomatoes ripening on the vine. It’s a summer sammie. Spread one slice with Russian. Layer on avocado (salt and pepper), thinly sliced Havarti, smoked turkey, sprouts. Cover with slice two, cut into triangles, and enjoy. Spread one slice with peanut butter, a scant 1/4-inch. Spread 1/8 teaspoon sambal over peanut butter — and do not flatter yourself, Jalapeno Boy, that you’re bigger than sambal. Drizzle a modicum of sweet soy sauce over. Add cucumber, red onion, tomato and sprouts (I like “spicy sprouts”) — I like my veg thinly sliced up to three layers, rather than one layer of chunky. Awesome sauce, thy name is tineka sandwich. I’m still working on the recipe I ganked from Alice’s Tea Cup , for a sandwich of cumin-roasted carrots, olive tapenade and goat cheese on black sesame semolina bread. It is quite the project, but roasted carrots and tapenade together are a ravishing combination, to the eye and to the palate. Pack sauce in container with lid. Pack in insulated lunch box with ice pack, along with other kit ingredients, each wrapped separately. Spread 1 Tbsp sauce over each pita; top with cheese and pepperoni. Place 3 Tbsp dip into small plastic container with lid. Pack in insulated etc. In 1-gallon resealable plastic food storage bag, combine chicken, buttermilk, and pepper sauce; seal bag. Refrig several hours or overnight. Preheat oven to 400. Line rimmed baking sheet with foil. Coat foil with spray. In bowl, stir together coating mix and cheese. Drain chix; coat with coating mixture. Place on prepared baking sheet. Bake 20 mins; turn over. Bake 20 mins or until crispy and chicken is cooked through. (Can be refrig for up to 2 days.) Pack in insulated lunch box with ice pack. Cook pasta following package directions; drain in colander. Rinse under cold water, drain. In bowl, toss pasta with remaining ingreds until evenly coated. Can be made 1 day ahead and refrigerated. Pack in insulated etc. Place all ingredients in blender. Process until thick and smooth. Pour into 2-cup plastic drinking cup with tight-fitting lid and built in straw. Refrig until ready to pack in lunch box. Pack in insulated etc. Preheat oven to 325. Line a 13 by 9 by 2 in baking pan with foil, extending foil 2 in beyond each short side of the pan; lightly coat foil with cooking spray. In large bowl, combine all ingreds for bars until evenly moistened and blended. Spoon granola mixture into prepared baking pan; firmly press mixture to form compact, even layer. BAke for 45 minutes, turning pan 180 degrees on over rack once, halfway through baking, or until top is golden brown. L:et bar cool in pan on wire rack. This soup is delicious hot or cold. In a medium saucepan, bring all ingreds except sour cream, to a boil stirring to blend tomato paste into broth. Reduce heat to medium-low; cover. Simmer 25 minutes, stirring occasionally, until onion and celery are tender. Let cool slightly. Transfer mixture to blender; add sour cream. Puree until smooth. Fill small thermos (1 cup) with some hot soup, or chill soup overnight and serve cold. On work surface, arrange 1 slice ham and 1 slice cheese, both slices lengthwise and overlapping, so combination slice is about 5 inches long. Top with another 1 slice each ham and cheese, putting ham over bottom cheese slice and cheese over bottom ham slice. Place one straw at bottom left edge of stack on diagonal; roll stack around straw. Wrap in plastic. Repeat with remaining ham, cheese, and straw. Pack in insulated etc. Dip: In mini food processor, blend cheese, sour cream and garlic. Add scallion and parsley; pulse 3 or 4 times to blend. Scrape into 2 small containers; refrig. Divide veg dippers into two containers. Pack 1 container dippers and 1 container dip in insulated, etc. On one bread slice, spread 1 T peanut butter evenly, all the way to the edge; spread with jam. Spread the remaining peanut butter on second slice of bread; top with banana slices, then spread evenly with Nutella. Place on top of peanut-butter and jam slice, banana side up. Top with remaining bread slice for triple-decker sandwich. With a serrated knife, cut sandwich into quarters. Wrap in foil. Pack in insulated, etc. In a small bowl, mash tuna, 2 T mayo, celery, relish, onion, s + p.
Cut toasted bread into “hands” with cutter; save trimmings for snacking. On work surface, line up 2 toast hands as left hands, 2 others as right hands. Spread each hand with the remaining mayo (3/4 t per hand). Spread tuna over left hands. Top with right hands. Gently press together. Place handwiches on paper plates; wrap. Pack in insulated etc. Open coating carton. Microwave on medium power 2 minutes, stirring every 30 seconds with rubber spatula until melted and smooth. Dip fruit into coating halfway, letting excess drip back into container. Place on waxed paper; let stand until hardened, about 15 minutes. (Dipped fruit can be refrig up to 2 days.) Let remaining coating cool and harden in container; cover with lid (can be remelted and used for more dipping). Pack dipped fruit in shallow 2 cup plastic container with tight-fitting lid. Pack in insulated, etc. Place tortilla flat. Spoon mayo and BBQ sauce onto center. Spread to cover tortilla. Top with lettuce. Place turkey in center, leaving 1 1/2 in. border around the edge. Layer on tomato and cheese. Bring tortilla edge closest to you up and over filling to enclose. Fold sides in; roll up, burrito style. Wrap in waxed paper. Cut in half diagonally. Wrap halves (keep in paper) tightly in plastic wrap. (Can be made 1 day ahead and refrig.) Pack in insulated, etc. Mix ingredients. Pack in plastic container (can make 2 days ahead). Pack in insulated, etc. Line 13 x 9 x 2 in. baking pan with foil, extending foil 2 in. beyond each short side; coat with cooking spray. In a 6-quart pot, melt butter over low heat. Stir in marshmallows until almost melted. Stir in peanut butter and vanilla until blended and smooth. Stir in cereal until evenly coated. Press marshmallow mixture into pan. Sprinkle with bits; press down. Let cool. Cut into 24 squares. Store up to 1 week in air tight container.